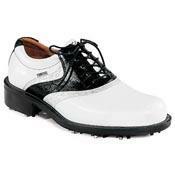 line Footjoy Classics.) Ecco is the world leader in comfort and anatomically sound footware for the street but historically their mid-priced golf shoes haven't had the lateral support necessary for that sport. Well that's not the case for the their top-of-the line World Classics. Being hand stitched and leather-soled, they have the most rigid construction and lateral stability of any shoe you can buy. And the wonderful premium grade leather upper (also hand made and stitched) is so wonderful you feel like your foot is being massaged as you play. To top it off they are completely Gortexed and hence 100% waterproof. The combination will almost certainly take strokes off your round compared to what you're currently wearing. New styling means they look great too -- you'll be very tempted to take off the spikes and wear them at the office. I know some will be put off by the price tag, but when you consider how long they will last compared to shoes costing half as much, they're actually a bargain for the active golfer. Good but not great. Helped me with sizing, but not as knowledgable as one would think given the quality of their products.